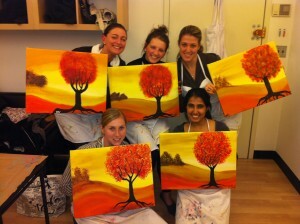 I’ll have my red vintage Patriots jacket on today and will be tempting fate at an undisclosed bar/resto in Manhattan, but if you’re not a football fan or simply not insane like me, here’s a cool thing to do if you’re avoiding rabid Giants fans in NYC: Paint Along’s BYOB class in the Flatiron District. Each two-hour workshop focuses on replicating one work of art on a 16x20” canvas and Super Bowl Sunday’s painting is entitled “Red Sunset.” Bring your non-football fan friends and a bottle of wine and indulge your inner artist. All skill levels are welcome so it doesn’t matter if you haven’t painted since third grade. The instructors give step-by-step guidance for completing each part of the painting and they’re more than happy to give one-on-one assistance. Tickets are $45 per person, and the two-hour workshop starts at 2:30pm. It's suggested that you arrive a bit earlier, however, to get those wine-induced creative juices flowing. 928 Broadway, Suite 803; 917-474-5587. I did this in Jacksonville last year at Yes You Canvas at the super-cool Sweet Pete's candy store, and I have a gorgeous painting of a sunflower as proof that anyone can paint.